Some of these polybags have merit based on the set they depict. Others are desirable for their parts. Some wouldn't even be worth anything at 75% off. This week we're looking at a mega-polybag so named for it's high part count. Where many of these polybags have 30-50 parts, the Springtime Scene has 88 (per the bag) which translates to 80 parts + 2 minifigs + 5 extra parts. Depending on what the parts are extras can be a boom or a bust. Most of the time I consider the 1x1 round plates to be a bust. But this set has only one in bright pink and two 1x1 round flower/bracelet plates in bright light orange and dark pink. And a green flower stem. And a red cherry. Not bad. If you are a landscape builder you will definitely want to consider this set. There are 3 4x8 green plates, a starter tree, and overall 4 types of foliage. If you're creative you might figure out how to use the lime ballcap or green frog as part of a bush. 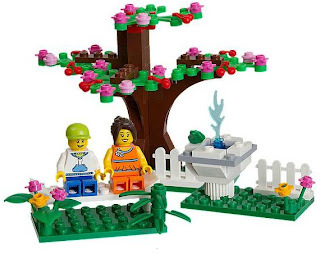 With a half dozen sets you could build a substantial tree or two and decorate the rest of the scene with flowers and other plants. Or use the fences to denote this as someone's beautifully manicured yard. Beyond that there are a few neutral colored parts. There are multiples of several of them in one set so the piece count adds up quickly when you buy more than one. The grooved round 2x2 bricks and solid 1x1 bricks make for nice columns. Perhaps you would add a nice temple or gravestone to your pastoral scene. I mentioned that some sets have merit for the actual set as well. I stand by this comment. This is a LEGO exclusive so you will only find it at the LEGO store, LEGO Shop at Home, and second market retailers. It lists for US$7.99 but it's exclusivity has pushed the average price to US$12.66 on Bricklink. Best bet is to purchase via S@H and get VIP points. Besides that we are currently enjoying free shipping for orders of US$75 or more. On May 4th and 5th this threshold will be dropped to US$50. If you like displays I'd say still go ahead and get this set . It's 10c per part which is the magical number everyone seems to like. For the parts enthusiast this should be a no brainer as well. My only problem is figuring out how to use so many inverted slopes.